Here you will find impression from the guests what was in romanian mountains with me. From Colorado U.S. to Transylvanian mountains. Spending part of sabbatical year in Romania. The main event of June in the Ciucas mountains is the full blooming of the Rhododendron flowers and nothing better than to spend the night in a comfortable chalet of Ciucas 1595m. Full moon,stars,scenery, silence and of course a Ciucas beer. We done in two day the Ciucas main ridge hiking trail starting from Bratocea pass 1272m, hiking up the Ciucas peak 1954m to Ciucas hut 1595m and Cheia monastery. 360* Panoramic views,diverse landscapes the famous rocky needles and sugarheads are the hallmark of the Ciucas mountains. 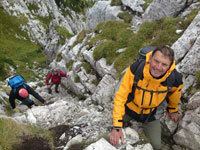 Is one of the wild Romanian mountain walking at is very best. Enjoy PHOTOS. Truly speaking I’m not fond of writing, so the mere fact of this message being written shows my great respect to the site owner. 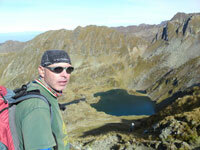 We met Daniel in January 2012, when we came to Sinaia with a firm intention to master the alpine skiing. Until then our skiing experience didn’t exceed training slopes in the vicinities of Moscow. We contacted Daniel and agreed our lessons by email. So he began skiing with us for 2.5 – 3 hours six days on end with a definite intention to make us “start moving”. This is a rather unique trait among coaches which inspires respect to Daniel. Besides that, the learning was constantly upgrading – on mastering an easy skill you move forward to a more complex one. Thus you have strength to cope with each new task or exercise. This is not the case when an excellent ski instructor is skiing ahead of the knocking themselves out trainees, and no matter how they do it. It is also worth mentioning that there was low snow on Cota 2000 on the first three days and we had to train right on the red route of Dorului, which also characterizes Daniel as an experienced coach who can not only take responsibility for the trainee’s safety on the slope, but teach him as well. And he really did that! Snow fell at our final lessons and then we start enjoying speed, sense of flight andcontrollable skis. On our return to Russia the slopes in the vicinities of Moscow seemed just hillocks to us…and we decided on going to Dolomites in Vale di Fasse. Those who have been there must know the routes of Sella Ronda – true read, as they say, and even black in places. It was our exam on the skills learned, and we passed it! This time we were skiing alone, without a coach. To say this was our first season seems enough…nothing to add. "Всем любителям горных лыж привет! Как говорится, не люблю писать, но сам факт этого послания, говорит о большом уважении к владельцу данного сайта.Познакомились мы с Даниилом в январе 2012 года, когда приехали в Синаю с твердым намерением освоить горные лыжи. До этого опыт катания был самый минимальный - учебные горки в Подмосковье. Списались по е-майлу и договорились о занятиях. Так вот Даниил катался с нами 6 дней подряд по 2.5 - 3 часа. С явным намерением добиться от нас результата, что бы мы "поехали". Это очень редкое качество среди инструкторов, за что большой респект Даниилу. Второй момент - занятия были построены таким образом, что обучение шло по нарастающей - освоил простой элемент - переходим к более сложному. Таким образом каждая вновь поставленная задача или упражнение были тебе по силам. Не было такого - впереди едет прекрасный инструктор - сзади корячатся ученики - не важно как. который, способен не только взять на себя ответственность за безопасность ученика на склоне, но еще и научить. И научил! На последних занятиях выпал снежок и мы уже получали удовольствие от скорости, ощущения полета, что лыжи тебя слушаются. По возвращению в Россию подмосковные склоны показались нам пригорками....и мы решились на поездку в Доломиты в Валь ди Фассу. Если кто там был знает - трассы Селла Ронда - нормальные такие, как говориться честные красные, а местами и черные. Это был наш экзамен на полученные навыки. И мы его успешно сдали. Катались самостоятельно, без инструктора. И это все на первом сезоне - ну что тут еще добавить. Сейчас продолжаем кататься, шлифуем технику карва. В сезоне 2013 отметились в Синаи и Доломитах. В январе 2014 с Даниилом освоили Пояну Брашов - опять в экстримальных условиях отсутствия снега. Даниил спасибо! Без тебя мы бы убились или вообще не смогли бы кататься))) Но три дня были наши! Олимпийским трассам Пояны Брашов - зачет. Poiana Brasov hiking resort represent a good base for day hikes in Saxon Transylvania because is easy to reach every points of interest such as Dracula Castle, Peles castle, Saxon villages (Crit, Messendorf, Viscri ,Miklosvar), bears sanctuary (rest house), waterffals, caves, seven ladders canyon, and the famous Romanian hiking garden ,,Bran hills,, That was the reason to choose this fine hiking resort for a nice family from Russia. "We are grateful to our mountain guide Dan for the pleasure obtained in hiking through the beautiful mountain trails of Transylvania. As well as an interesting journey by bicycle to the Saxon village with tasty treats rhubarb jam. Sergei, Elena, Slava of Russia." The new hiking season is open and I walked on first of May 2013 on the Bran hills a Romanian natural exposure amongst mountains, forests, remote mountain willages and glades. Enjoy hiking and PHOTOS. In the middle of September I started a hiking tour with two guests Magnus and Pablo from Sweden in Fagaras mountains from Poiana neamtului chalet 706m to Barcaciu chalet 1550m , Negoiu chalet 1546m over Negoiu peak 2535m (the second highest peak in Romania) Paltinu chalet 2034m (former hunting chalet of Dictator Nicolae Ceausescu) and finale at Sambata de sus monastery. We had good food as lunch in the trekking days (cheese packed in fir bark and Sibiu salami the best in Romania) and excellent weather except last day (rainy) After a short visit in Sibiu medieval city (former European cultural capital in 2007) and Peles castle in Sinaia resort (former summer residence of the Romanian Royal Family) we get back to Bucharest airport. Enjoy PHOTOS. Beginning of September together with my friends and former colleagues Helmut Hochwallner, Franz Oppenauer, on the first day also Kurt Lieskounig was with us and our guide Dan Sorica we went to the Romanian Carpatians. We arrived Otopeni airport on Saturday late afternoon and went straight on to Sinaia where we stayed overnight in the very nice Villa Camelia. On Sunday morning we moved on to Fagaras/Balea Lac and at about lunch time we started our walk to the Molodoveanu peak. After an almost seven hours walk hill up and hill down we arrived the hut Podragu, 2.136m and stayed overnight there. Next day morning we went on via Vistea Mare Peak (2.535m) and about lunch time we arrived on the Moldoveanu Peak (2.544m). We enjoyed the view from the top and the special lunch. We followed a partially very steep and burdensome path. As it was a very sunny day we run out of water and were very lucky to find a spring. Passing the "Fereastra Mare" we finally arrived Sambatei hut after about 10hrs walk. Even it was a very simple hut we were happy to find a bed and spent the evening on a campfire chatting with other hikers. Next day morning there was light rain we went through the Sambatei Valley. We visited Brancoveanu-Monastery and took a taxi back on Pass Fagaras/Paltinu Hut to pick up our own car. From there we had a short visit in Sibiu center and Sigishoara and drove to Moeciu in a very nice hotel. Next day we went to Bran and drove to the Fantana lui Botorog to start the walk on the La Om highest peak in Piatra Craiului (Königstein-Gebirge). It starts with a steep rise of 2,5 hrs to arrive Cabana Curmatura (1.470m). Compared to the prior huts a luxury accommodation although the hut was under renovation. But I have also to mention that no road leads to the hut Sambatei and Pogradu and the supply has to be carried out by donkey caravans. Next morning start to the peak. Steep way up sometimes almost climbing we pass Ascuit (2.150m), Timbalul Mare (2.177m) and reach after 2hrs. the La Om peak (2.238m). In total we had a nine hours walk on that day. The weather was good for walking but there was heavy wind blowing. 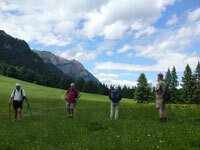 Next day we planned an easy walk and went the Canionul Sapte Scari. We arrived the Cabana Piatra Mare (1.630m) means up 1.000m from our start. It wasn't easy at all. Also there the weather was good for walking with some rain and wind. Then we visited Brasov and went to Sinaia to Villa Camelia again. Last day on our trip we went up with the tele kabina to Cabana Miorita (1.987m). Very relaxed we went down to the middle station, took lunch and drove back to BUCHAREST airport. It was a partially hard but very nice trip. The weather was fine for a walk and the paths very well marked. No injuries and we didn't encounter bears. 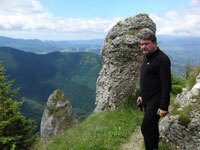 We spent two enjoyable weeks in June with Dan, hiking and touring in the Bucegi mountains. Dan was a great host and guide for our visit. Thanks for a great trip, Dan! Thanks to our terrific and very knowledgeable tour-guide our trip was a succes, we both look foward to the return in the future travel in to the eastern europe.